« September 1st and 2nd: Southern Hemisphering! Once were safely on the ground in Auckland, the first mission was to buy or hire a car. 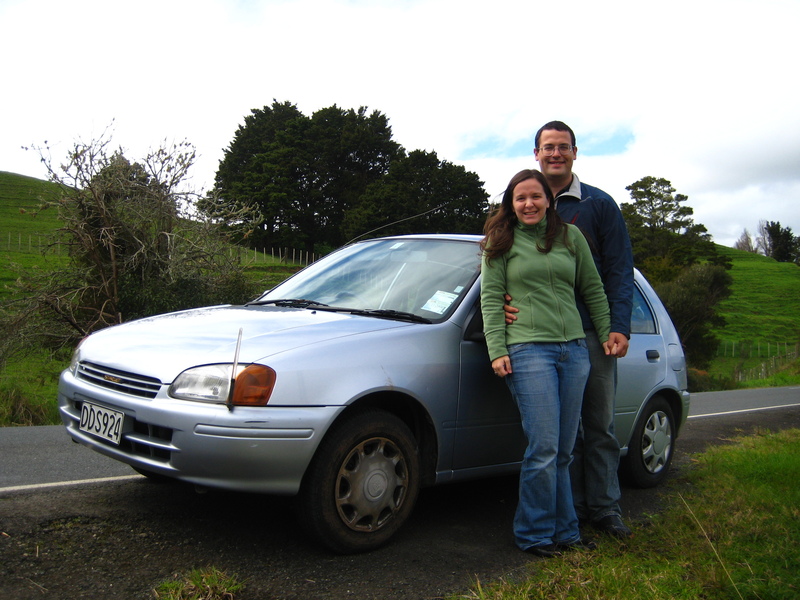 We ended up with an adorable, zippy little 1996 Toyota Starlet for just NZ$11 a day for our trip. We’re quickly adjusting to driving on the left side of the road. Trickier is the fact that the controls for the turn signal and windshield wiper are reversed from what we’re used to, so we end up signaling some turns by wiping our windshield. We set out in our new car to New Zealand’s Northland. 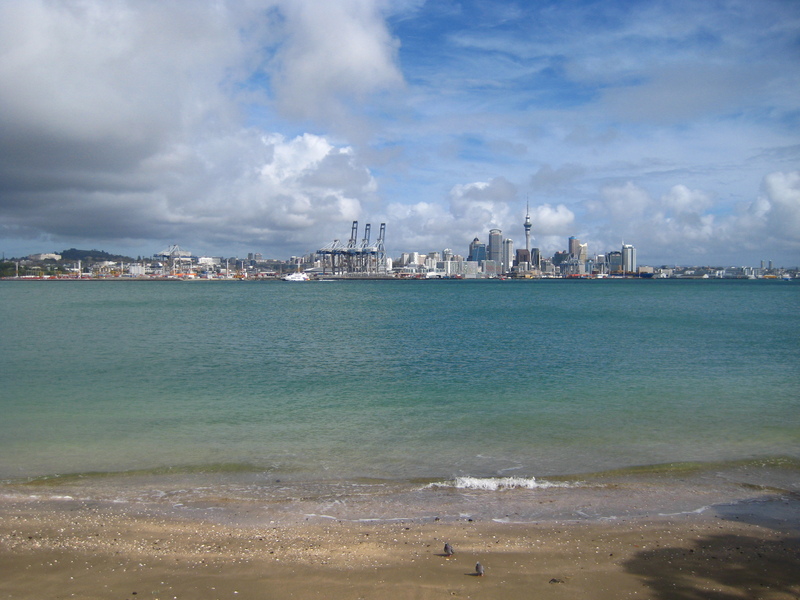 We stopped for an afternoon in Devonport, just across Torpedo Bay from Auckland, where we had a terrific view of the Auckland skyline. 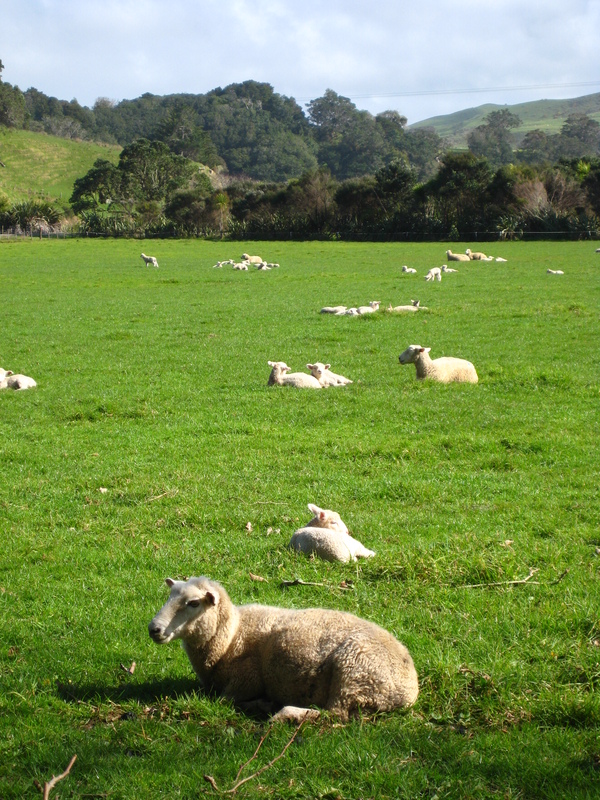 Our first trip out into the country also gave us our first of what will surely be many sightings of New Zealand sheep. They were somehow not as excited to see us as we were to see them. From Devonport we drove north along the east coast. The scenery in Northland is spectacular. We camped in a park on Hauriki Bay, where we were awakened before dawn by a multitude of bird calls that sounded really unnatural. The park is the site of a project to reintroduce native fauna to the area, so they were probably denser there than anywhere else on the island. So much for sleeping in! 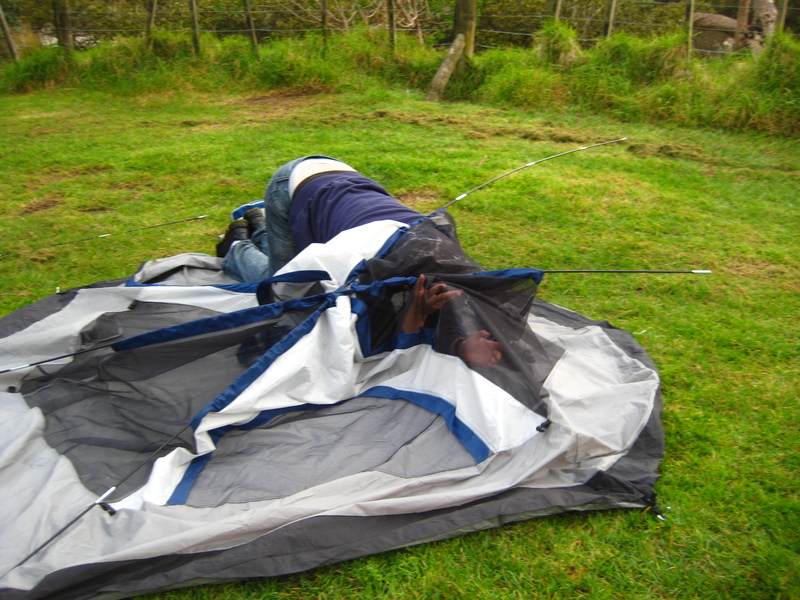 Jonathan gets stuck in the tent. 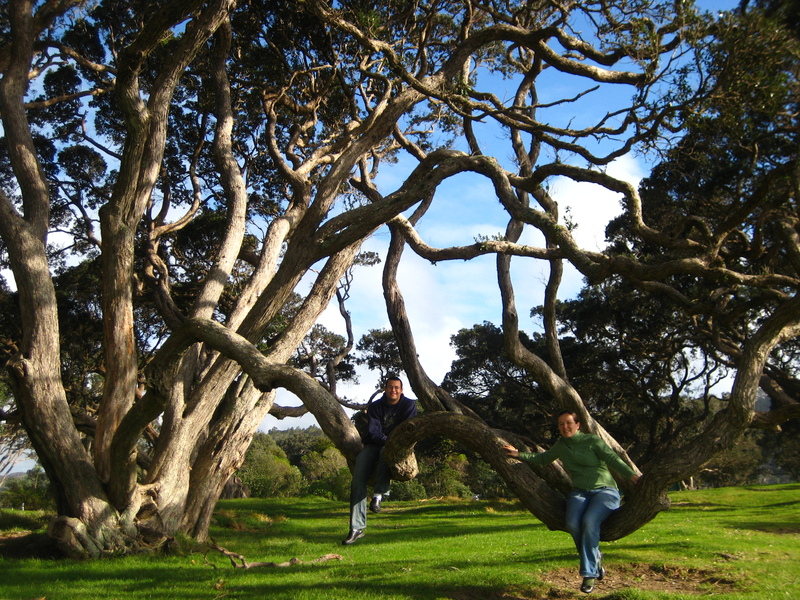 We went on a hike from our campsite to a hilltop with a magnificent view of Hauriki Bay and then down to the beach, where there were a bunch of pohutukawa trees, some of the most bizarre-looking trees we’ve encountered yet. The gnarly branches of the pohutukawa make for good seats. Heading up the west coast of the North Island along the Tasman Sea, we drove through the Waipoua Forest, home to the world’s oldest and largest living Kauri trees. We had to stop for about an hour to wait out a rainstorm, which was fitting for this rainforest. The vegetation was incredibly thick and was the most surprising combinations of evergreens, desert-like brush, and palms. 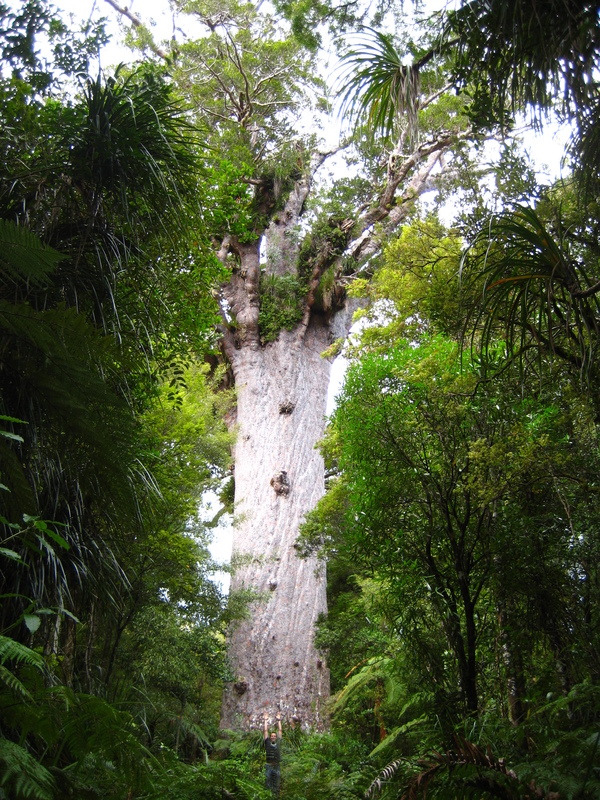 The tallest and oldest single kauri tree, called Tane Mahuta (God of the Forest in Maori), scrapes the sky at over 50m tall and a whopping 14m wide. Look closely - Jonathan is short, once again. Sadly, the camera battery died before we were able to capture the breathtaking views from the northern end of the park, looking out over a small valley filled with lush greenery. The sun, just coming out after a spell of rain, added even more to the scene. We stayed in a hostel not far from there, overlooking the Hokianga harbor, where as we watched the sun set that night, a seal was playing in the surf. This entry was posted on September 7, 2008 at 10:39 am and is filed under Uncategorized. You can follow any responses to this entry through the RSS 2.0 feed. You can leave a response, or trackback from your own site.